I think it's great that more and more people become aware of what they eat and are focussing more and more on eating healthy. As part of my philosophy on healthy & clean eating I incorporate Superfoods into my daily meals. So I decided to start writing posts about Superfoods, and each time I will put one I frequently use in the spotlight! I will list all posts as well as the first introduction section of this post about superfoods on a separate page on my blog: simply click the Superfoods tab! But first, what are Superfoods? Superfoods are products that, in countries from which they originally came from, are eaten for thousands of years, so they are sort of ancient foods. In comparison to other foods they contain up to fifteen times the nutritional value. By eating Superfoods, your body will be supplied, through the same amount of food, with many more vitamins, minerals, antioxidants and other nutrients. Unfortunately, by eating 'regular' fruits and vegetables we don't get enough good nutrients in our system. You really need to eat a lot more fruit & vegetables then you do right now to really have a healthy lifestyle. A recent study by TNO (a Dutch research institute were I'm currently doing my PhD) showed that only 42% of the Dutch people eat at least 200 g vegetables each day and only 35% of eats 2 pieces of fruit every day. 2 pieces of fruit each day and 200 g vegetables are the Dutch guidelines which I personally think are both still too low. I believe you should have vegetables at minimum at lunch (salads) and dinner and for breakfast and snacks I always have fruit. But the numbers clearly show that we, in general, are eating even less fruit and vegetables then the guidelines state we should eat. Could you imagine how few people would met the guideline if we even needed to eat more fruit and vegetables?! And on top of that the nutritional value of non-organic fruit and vegetables has declined with more than 70% since 1945! So we need to eat a whole lot more of these products to get the same amount of nutrients in our systems compared to 70 years ago! I think that's shocking. So by eating Superfoods you will get a lot more healthy nutrients in your system! Superfoods can be taken in replacement of some products you already eat, but I like to add them to my meals (especially breakfast) in order to supplement it and really see it as an additional to my diet. They are in general expensive, but you only need a little bit to start feeling the benefits. So I would advise you to slowly start adding Superfoods to your pantry so you can spread the costs and it fits your budget! And all Superfoods have different but natural tastes. Some take some getting used to but it is so worth it! If you want to learn more about Superfoods, How to start with it and some great recipes you really need to buy the Dutch Book: 'Superfood Recepten' van Jesse van der Velde! And were can you get them? I usually bought mine at the local organic store. In general they have a wide assortment of Superfoods. I like to go to Heerlijk Wormerveer or to GooodyFooods Zaandam. But when I was going through all the advertising leaflets this week I noticed that the Dutch drugstore Etos is now also selling Superfoods. I think this is great because in this way it's more accessible to consumers who aren't that familiar with going to organic stores, and they sell it in smaller portions so you can try it out against a low price! So in my opinion, perfect! And now on too the first Superfood that will be in the spotlight: Bee pollen! Definitely one of my favorite Superfoods because, besides the fact that they are super healthy, they have a sweet honey-like taste! I like to add them to my breakfast and smoothies. But you could also consider to use them in salads or in salad-dressings, as garnishing on healthy desserts or sprinkle them over a bowl of strawberries! Bee pollen are made by honeybees and are the food for the bees. They are made from the pollen of flowers that bee carry with them. The pollen adhere to their hind legs and hairs. When the bees carrying the pollen arrive at the hive, the bee will add some substances and forms granules. They are considered one of nature's most complete nourishing foods as they contain nearly all nutrients required by humans. Bee pollen can be used to balance your state of mind and strengthen your immune system because they contain the immune system stimulants RNA and DNA which both support cell growth, cell renewal and cell repair. So they enhance tissue repair and delay aging and are great for your skin. Bee pollen are also natural energizers as they enhance your energy levels and overall vitality but also your concentration levels and endurance will improve. Moreover, they regulate the digestive system and hormone levels, which are often disordered when you are experiencing stress or show depressive feelings. And of course, here is the recipe for one of my favorite breakfasts (especially this week!) to which I add bee pollen. And yes, I do have the feeling that I get more work done during the day when I add 1 tablespoon of bee pollen to my breakfast. Slice the banana and cut the apple (remove the skin). Put the quark, banana & apple (except for a couple of pieces to put on top) in your blender and blend until smooth. Pour it into a bowl and top with the muesli, the rest of the banana & apple, blueberries and bee pollen. Tried out a recipe today from the Dutch cookbook: Koken met Karin: Zonder pakjes & zakjes Deel 2. Made her red paella with some changes to make it fit my budget! Boil 1 liter water in your kettle. Cut the onion, heat up 1 tbs olive oil in a large frying pan and put the onion and 2 crushed garlic cloves in it. Quickly deseed and chop the paprika and add to the pan and cook for 5 minutes in total. Add the tomato puree and the rice, give it a good stir, crumble over the stock cube and add 0.5 liter boiling water. Let it cook for about 25 minutes on medium heat, and stir regularly. If it's getting dry add more water until the rice is soft and cooked. After 15 minutes add the frozen peas and chicken. During the stirring process, cut the chicken, season with salt, pepper and paprika powder and bake golden brown in 1 tbs olive oil. When they're done, save in a bowl with aluminum foil over it until you can add it to the rice but leave the pan on the heat. Add the wok shrimps with some more paprika powder and a little bit of oil if necessary. Cook for a couple of mintes until their done. When the paella is done, put the shrimps on top and leave in the pan for 5 minutes with the lit on. Serve with some freshly chopped parsley and lemon wedges. Kook 1 liter water in de waterkoker. Snijd de ui, verwarm 1 eetlepel olijfolie in een grote hapjespan en doe daar de gesneden ui en 2 teentjes geperste knoflook bij. Verwijder snel de zaadlijst uit de paprika en snijd deze in kleine stukjes. Doe bij de ui in de pan en bak voor zo'n 5 minuten totaal. Doe de tomatenpuree en rijst erbij, even goed roeren, verkruimel het groentebouillonblokje eroverheen en voeg een halve liter water toe. Laat het geheel koken op middelhoog vuur voor zo'n 25 minuten. Roer regelmatig. Op het moment dat het wat droog word doe je een glas kokend water erbij totdat de rijst zacht en gekookt is. Snijd ondertussen de kip in stukken, breng op smaak met peper, zout en paprika poeder en bak goudbruin in 1 eetlepel olijfolie in een koekenpan op middelhoog tot hoog vuur. Bewaar ze in een kom met aluminiumfolie eroverheen totdat ze bij de rijst kunnen. Wanneer de rijst 15 minuten kookt doe je de gebakken kip en erwten erbij. Doe de wokgarnalen in dezelfde pan als de kip met een beetje meer paprika poeder en indien nodig een klein scheutje extra olijfolie. Bak voor een paar minuten tot ze klaar zijn. Wanneer de paella klaar is leg je de garnalen erboven op, doe de deksel op de pan en laat 5 minuten staan. Serveer met de vers gesneden peterselie en wat citroenpartjes. It's Tuesday so time for bootcamp! Made this delicious kip Siam for dinner tonight. Normally I always ate pasta before my workout but last week I had rice and my workout went amazing! So I figured, why not try it again, so I'm curious to find out how my workout will be tonight! Made 3 portions kip Siam and I sold the other two on www.thuisafgehaald.nl if you are living in the Netherlands and haven't heard about it before you should definitely check it out! It's a great way to buy or sell food so nobody has to throw away anything. Cut the chicken into small pieces, heat up 1 tbs olive oil in a frying pan on medium heat and add the chicken. Slice the onion into small pieces and add to the frying pan with 1 crushed garlic clove. Then slice the zucchini and add to the pan followed my the sliced paprika's. The chicken and vegetables need about 10 minutes. After the 10 minutes you need to add the soy cream, soy sauce, lemon juice and season with salt and pepper. Give it a good stirr and let it simmer on low heat for a couple more minutes. Serve on top of the rice and sprinkle over the cashew nuts. Cook the pasta as directed on the package. Heat up 1 tbs of olive oil in a frying pan, add the crushed garlic clove and finely chopped anchovy fillets and cook on low heat for 2 minutes. Quickly cut the chicken into small cubes, heat up another tablespoon of olive oil in another frying pan and bake the chicken golden brown and cooked in 6 minutes on medium to high heat. Add the can of tomatoes to the pan with anchovy, add the leaves of the thyme sprigs and give it a good stir and let the sauce thicken on low heat. Cut the broccoli into florets and cook along with the pasta during the last 5 minutes of the pasta's cooking time. When the sauce has the right consistency, turn of the heat and stir in the soy cream. Drain the pasta an broccoli and add to the sauce. Make sure everything is covered in sauce and serve with some grated Parmesan cheese on top. The cauliflower was on sale this week. Normally I eat this when I eat at my grandma's but I haven't been there in a while because I'm super busy finishing my PhD so I thought why not make a cauliflower dish myself! So I decided to make a puree and serve it with pangasius fillet. Stewing the fish is absolutely amazing! All the flavors are absorbed by the fish and it gets really tender, so perfect! Boil 2 liter water in your kettle. Cut the onion, paprika and tomato into cubes and cook for 5 minutes in a large frying pan on medium heat with 1 tbs olive oil. Meanwhile cut the cauliflower into florets, put in a pan with about 1 liter boiling water, just make sure they are all under water and cook for about 10 to 12 minutes until tender. After 5 minutes, crumble the stock cube over the paprika mixture and add 1 liter boiling water. Give it a good stir, add salt & pepper and then put the frozen Pangasius fillet in the pan, bring to a boil and then leave to simmer on low heat with the lit on the pan to stew for 20 minutes. Clean the beans and add to the pan after 10 minutes. Drain the cauliflower when it's done, cut into smaller pieces and put in your blender with the rest of the ingredients except the parsley. Blend until it is somewhat more smooth but there are still some small cauliflower chunks. Put into a bowl and garnish with fresh parsley. When the fish is almost done, quickly roast the almond flakes until golden brown. When the fish is cooked and tender put it on your plate and top with the vegetables and almond flakes. Serve with the cauliflower. You can also follow me on FACEBOOK and INSTAGRAM! Follow the buttons at the top in the right side bar! Time for another lunch recipe! As you know I usually have salads or sandwiches but I want to eat less bread and these quinoa crackers are the perfect solution! Cracker 3: Slice of chicken breast with cottage cheese, cherry tomato, avocado and seasoned with pepper. I had lots of blueberries left over from last week's visit to the market so I figured it was time to try out a new recipe. I baked one on Tuesday, which, unfortunately wasn't that good so I tried to make another one today and changed the ingredients a little bit. And... it turned out great! Definitely having this for breakfast tomorrow and just had it as an afternoon snack. Simply mix all dry ingredients in a bowl and the wet ingredients except for the olive oil in another bowl, including a mashed banana. Make sure you whisk the eggs. Then combine the dry and wet ingredients together and mix with an hand mixer until well combined. Then stir in the olive oil, followed by the blueberries (gently). Line a cake tin with grease proof paper and pour the batter in. Put it in your preheated oven for 45 minutes. The bread is done when it's golden brown on top and a toothpick comes out clean. Had a super busy day today with work and in the evening a meeting about the upcoming E-Book but today I've scheduled time to write a new blog post. But first make sure you follow me on Facebook or Instagram! I'm getting ready to hit the gym tonight so made a delicious gluten free vegetarian and vegan pasta with mushrooms for dinner tonight! I used soy cream because that's a perfect alternative for creams made of cow milk. Soy cream contains plant-based proteins that are healthier than the proteins from animal products like cow milk. But I do want to stress that it is important to make sure you have a balance between proteins from animals and plants because the combination is the best. Too much of anything isn't good ;)! The main reason that plant-based proteins are good is because they contain less methionine and sulfur amino acids. And soy contains all necessary essential amino acids, whereas other vegetables, nuts, seeds, grains and beans do not. However, you should limit your intake of soy products because they are classified as high estrogenic food and it's often extremely processed. Still it's in my opinion better then cow milk or related products, but don't over-use it and make sure you eat a variety of plant-based foods so that you, over the course of the day, obtain all the necessary amino acids! And now on to the recipe! Heat up 1 tbs olive oil and the crushed garlic clove in a frying pan on medium to high heat. Then quickly cut the mushroom in half or four and add to the pan. Give it a good stir and then slice the leek into rings and add to the frying pan. When the mushrooms are done, pour in the soy cream and season with the parsley, salt and pepper. Let it sit on low to medium heat for about 4 minutes and make sure you stir from time to time. Meanwhile, roast the pine nuts, cut the cherry tomatoes in four and drain the pasta when it's done. Put the pasta on your plate, followed by the mushroom sauce, a handful arugula, the cherry tomatoes, pine nuts and finish with some grated parmesan cheese. Add more salt & pepper to taste! Kook de pasta zoals aangeven op het pak. Degene die ik gebruik moet 8 minuten koken. Verwarm 1 eetlepel olijfolie in een koekenpan op middelhoog tot hoog vuur. Voeg het geperste teentje knoflook toe. Snijd snel de champignons in vieren en doe ze in de koekenpan. Even goed roeren en snijd ondertussen de prei in ringetjes en doe deze bij de champignons in de pan. Wanneer de champignons naar wens zijn doe je de soja kookroom erbij samen met de peterselie, zout & peper. Snijd ondertussen de cherrytomaatjes in vieren. Serveer de pasta met de saus erbovenop gevolgd door de rucola, cherrytomaatjes, pijnboompitten en wat grof geraspte Parmezaanse kaas. Voeg eventueel meer zout & peper toe naar smaak. Before I started eating clean I ate a lot of meals from Knorr (a Dutch brand with all ingredients except fresh vegetables and meat in a box) and one of my favorites was the chicken madras. Since I started eating clean I haven't eaten it at all and I finally tried out a recipe to make it without any food additives and it turned out great! Cut the chicken into small pieces , heat up 1 tablespoon olive oil in a wok and cook the chicken with salt and pepper until golden brown. Meanwhile, cut the tomato into cubes, the onion into pieces and cut the ends of the beans and cut them in half. When the chicken is done put them in a bowl and set aside. Heat up the other tablespoon of olive oil and put in the beans. Bake for about 3 minutes and then add the tomato and onion. Bake for another 5 minutes until the onion and beans are somewhat soft. Add the curry paste and bake for another 2 to 3 minutes. Add the coconut milk, give it a good stir, then add the chicken and let it simmer on low to medium heat for 10 minutes until the sauce is somewhat thicken. Add some water if it's too thick. Cut the apple into small pieces and stir through the curry at the end for 1 to 2 minutes. Serve the curry on top of the rice. Alright after lots of requests I decided to post the recipe for my amazing vegetable lasagna earlier on the blog! I made this yesterday evening and it was delicious! Perfect combination of flavors. If you're wondering how can one girl eat a whole baking dish of lasagna, well she can't and since I'm a food blogger it also not that convenient to freeze it all in my freezer. So I decided to offer some portions on www.thuisafgehaald.nl and sold all 3 and luckily they also loved the lasagna! If you haven't heard of this Dutch website you should definitely check it out. It's a nice way to get in contact with your neighbors and they pay you for your food and you don't have to throw away anything. Preheat your oven to 200 degrees of Celsius. Cut all the vegetables. Heat up a good splash of olive oil in a large frying pan with 4 crushed garlic cloves. Then put in the sliced carrots and onion and bake for a couple of minutes. Then add the mushrooms and after a couple more minutes the zucchini and paprika. When the vegetables are soft add the passata, diced tomatoes and peas with all te herbs. Season with salt & pepper and let it cook on medium heat for about 7 to 10 minutes. In the mean time, slice the tomato and mozzarella. Grease a lot baking dish and when the sauce is done layer the lasagna. First put in a layer of the sauce, followed by lasagna sheets, another layer of sauce, lasagna sheets and finish with a layer of sauce. Put the slices tomatoes on top followed by the mozzarella and grated cheese. Put it in the oven for 40 minutes! When it's done get it out of the oven and let it sit for about 5 minutes with some aluminum foil. Variation tip: serve with a nice simple salad with cucumber, cherry tomatoes and roasted pine nuts. With a dressing of balsamic vinegar. Sorry for the lack of post yesterday but I woke up late with a hangover form the party Friday night (yes guys I do drink alcohol from time to time. Nothing wrong with letting loose sometimes and just have fun without worrying about anything, including healthy living). In the afternoon I made time to catch up with a good friend of mine. We had lunch at Manzo's Zaandam and it was fun! Did all my groceries afterwards and when I came home I was feeling so tired that I made a simple meal: wraps and watched some tv before I got to bed. But today I'm feeling great again so after a delicious breakfast I was craving eggs and salmon. So I though why not combine the two and make a fried egg on toast with smoked salmon. And guys... it was A-M-A-Z-I-N-G!!!! Toast the slices of bread. Put a frying pan on medium heat and heat up some butter. When the butter is melted crack the eggs in the pan, make sure the yolk remains intact. And simply cook until done. When the toast is ready smear with the mayonnaise, put the smoked salmon on top. When the eggs are done put them on top of the salmon. slice a spring onion into rings and sprinkle over. Season with salt and pepper and this absolutely amazing lunch is ready to get in your tummy! Today I decided it was time for a new quinoa risotto! After going through all my cookbooks to find some recipes for next weeks menu I discover a regular zucchini risotto in a Dutch Cook book: Koken met Karin [zonder pakkes & zakjes deel 2]. That gave me the idea to make another quinoa risotto! I used red quinoa this time because I had some left and red quinoa even contains more nutrients compared to white quinoa. The concept behind it is basically the same as with brown and white rice. For this recipe I used the basic quinoa risotto posted a while ago and I used left over zucchini and chestnut mushrooms. Add about 1 to 2 sprigs of finely chopped fresh rosemary leaves and the quinoa. Crumble over the vegetable stock cube and 1 glass of boiling water and let it cook on medium heat until the stock has been absorbed, stirring regularly. During the stirring process (which takes about 20 minutes) add cups of boiling water until the quinoa is done (you need approximately 1 liter). Meanwhile chop the mushrooms in four and zucchini into cubes or slices in four. Remove the pan from the heat when the quinoa is done and stir in 2 tablespoons of grated parmesan cheese and some fresh thyme leaves. Let the quinoa soak for 5 minutes. Bake the mushrooms and zucchini in 2 tablespoons of olive oil and one crushed garlic clove. Season with salt & pepper and some fresh thyme leaves. Stir about 3/4 of the vegetable mix through the risotto and add parmesan cheese to taste. Put the risotto on a plate, finish of with the rest of the vegetables and garnish with some more parmesan cheese. I'm trying out some new lunch salad combo's because lately I ate the same combinations and this was getting a little bit boring. So I'm going out of my comfort zone and challenging myself to make some salads with products I usually don't use in a salad. So no cucumber and tomato combinations but something completely different! And my version of a traditional Waldorf salad is absolutely amazing, as I say so myself. The combination of flavors is surprising and they really complement and enhance each other! So of course I had to right a post about it and provide you with the recipe! As a always take my salads with me to the office I prepped this one the evening before and stored it in my refrigerator. So make sure you have a boiled egg and roast your walnuts. Add all the ingredients to an airtight box, but don't slice the apple yet because then it will turn brown. So you have to do this when you're going to eat your salad. But you can crumble over the white cheese and already add the sliced chicken breast filet, cranberries and roasted walnuts. Mix the ingredients for the dressing in a separate small airtight bowl and also store in your refrigerator. Time to give you another great pasta recipe! It was a super busy day today so I'm glad I am at home right now. Finally time to relax after I write this blog post! This pasta is super easy and quick to make, I had it after my workout and it was perfect. Don't feel hungry at all right now. Boil water in your kettle. Slice the chicken into cubes of the same size. Add the chicken to a frying pan with a splash of olive oil and season with salt and pepper. Cook on medium heat. Slice the mushrooms and onion and add these to the pan after about 5 minutes together with 1 crushed garlic clove and the cherry tomatoes. Bake for another 5 minutes until the chicken is done. Meanwhile, add the avocado, fresh basil leaves, the other crushed garlic clove and a splash of water to your blender. Season with salt and pepper and blend until smooth. Add more water if it's too thick. When it's a smooth sauce add the juice of half a lime, mix and pour it into a bowl. Slice the tomato into small cubes and mix with the avocado-basil sauce. Drain the pasta, mix with the chicken and vegetables and then stir through the sauce. Serve with some parmesan cheese flakes on top. I came to the conclusion that the only 'regular' oatmeal recipe posted on the blog was my Banana-Apple Oatmeal. Which means that it's time for a new one because that's not the only way I eat my oats in the morning! The E-Book will also contain some oatmeal variations but not this blueberry oatmeal. Put the almond milk and oatmeal in a saucepan and cook until the oats are done. Meanwhile slice the banana into small pieces and put 2/3 of the banana, the cinnamon and vanilla extract in the saucepan with the oatmeal. Add 3 tbs blueberries, linseeds and chia seeds, give it a good stir and let it sit on low heat. After 5 to 10 minutes from start, turn of the heat and let it soak for a couple of minutes. Crush the pecans, put the oatmeal in a bowl, top off will the rest of the banana, blueberries and crushed pecans. It's Monday, time for a new week full of new opportunities! My week has started great, I got an email that my second article is now published in the correct version and it's highly accessed (which means that it has been downloaded more then usual in the first 2 weeks)! So feeling proud right now and full of energy to work on my other articles! The published article is a review of literature about factors that influence the implementation of worksite health promotion programs focussing on healthy lifestyle! For those of you who are interested you can access the article here. As you know I made Wednesday no carbs day. But today on the menu was Mexican chicken with vegetables and rice from Jamie's 15 minute meals. So I made the dish with rice, but the chicken and vegetables were so tasty that I didn't even touch the rice! So this is a perfect carb free dinner!! Great tastes and of course if you want just serve with brown rice. Boil 400 ml water in your kettle. Cut the carrots into thin slices, the spring onions into rings, put them with the boiling water and thyme sprigs in a frying pan on medium heat and crumble over the stock cube. After 5 minutes put the chicken into the pan together and put the lit on. Clean the beans and cut the ends off and deseed and slice the paprika's. Add to the pan together with the frozen peas and put the lit back on and let the chicken cook for about 10 minutes (depending on the thickness of the chicken so make sure you check!). When the chicken is done get it out of the pan and put on a chopping board. Put the vegetables and some broth on a soup plate, slice the chicken and put on top. We all know the french toast ('Wentelteefjes in Dutch) we ate when we were younger! So today I made a healthy version after a rainy Saturday morning bootcamp! And oh my, they were absolutely amazing!!! Love them! But it's more a breakfast recipe and certainly not a whole lunch. Here is the recipe so you can make these yourself! 2 slices of whole wheat (spelt) bread. A little bit older bread is even better! In a large bowl or soup plate mix the egg with the almond milk and cinnamon. Put a non-stick frying pan on low to medium heat with a small piece of butter. Dip the slices of bread into the egg mixture so all sides are covered. Bake them in the frying pan until both side are golden and crispy! Meanwhile slice the banana. Put them on a plate when done and top with the Greek yoghurt, sliced banana, blueberries and shredded coconut. Add some agave syrup to taste (I left this one out). Recently I got some questions from readers what I eat when I go to a restaurant which give me some inspiration for writing this post. But first let me say, I don't always eat clean when I'm eating out. I believe that cheating sometimes is good for your metabolism so when I'm eating out I usually have whatever I am craving or looks good. But I can imagine that if you eat out a lot you can't do this every time. I've discovered that eating clean while eating out can actually be very difficult. It can be very confusing when you read the menu since it's not always clear what is clean and what is not. So the first and most important tip is that you don't need to be afraid to ask for changes to the meal you choose. The most simple ones are that you could ask for whole wheat bread instead of white bread when you're having a sandwich or ask if they could serve the dressing on the side. By asking for any sauce of dressing on the size you can control how much sauce you put on your dish. Of course I can imagine that the people you're eating out with can get very annoyed when you make a lot of changes to the menu, but to be honest, that's their problem and most restaurants are happy to make the changes you request. It can be more difficult if you're eating at places like fast food chains since they actually don't have any healthy options to choose from. So I mostly stay away from these places at all. Why spend your money there if you could have a much more tasty and healthier meal in an actual restaurant which is also more cozy?! Vietnamese, Thai and Japanese restaurants are on the other hand always a great place to get healthy and tasty food, except of course for the deep fried and battered things like spring rolls. Furthermore, vegetarian options are almost always a good pick. Because usually they contain a lot of different vegetables. And salads are always good if you ask for the dressing on the side. But I can imagine that you/re not always in the mood for a salad, especially if you do the same as me, and often have a salad for lunch. So then I always first look at the fish dishes but stay away from deep fried, crumbed or battered fish! If you fancy meat I would advise you to first check the 'chicken section' as this is the most lean meat you can get. But if you want a clean meal, stay clear of side dishes like fries and mashed potatoes. And instead get a salad or (steamed) vegetables on the side. I always stay away from pork dishes because I don't like it at all and pork is really hard to digest! But if you feel like having a steak choose a small one and same as for the chicken, replace the side dishes. Steak is often served with additional gravy and sauce so ask it on the side or simply omit it and ask only for, for example, baked mushrooms and onions. In a lot of restaurants you get bread served as a starter. Always ask for whole wheat bread and stay away from the white bread and the spreads served with it. Just ask for some good quality butter instead! And last but not least, dessert. Sadly most places do not have a healthy option for dessert. But you can always ask if they could make a nice fruit salad. And sometimes they serve homemade sugar and lactose free sorbet ice cream! But besides that, all other dessert are high in fat and sugar so it's best to skip dessert all together and order a cup of (fresh mint) tea instead. Of course leave the cookie that is served with it! So the main message is, if you want to eat clean when eating out, it can be difficult, but don't hestitate to ask the waiter for changes even is someone on your table is annoyed by it. You need to be able to be yourself despite what other people think of it! I thought it was time for a new couscous recipe! As much as I loved the the couscous salad posted in August 2013 it was time to shake things up! So I made a tasty vegetarian version which you definitely need to try if you love couscous! Boil some water in your kettle. Clean the beans and cut of the ends and put them in a pan with boiling water and a pinch of salt for about 8 minutes. Chop the mushrooms and paprika. Heat 1 tbs olive oil in a frying pan and bake the mushrooms and paprika until they are both soft and done. During the last minute shortly heat up the chickpeas. Meanwhile, cook the couscous as directed on the package. For the couscous I use I need to poor 200 ml boiling water and 2 tbs olive oil in a pan, stir in the couscous and let it soak for 2 minutes. Then put it on a low heat, add 1 ts butter give it a good stir and let it on the gas for 2 minutes and then it's done. Mix the vegetables with the couscous and drizzle with the apple cider vinegar and extra virgin olive oil. Season with salt & pepper, crumble over the feta cheese and finish with some freshly torn mint leaves. Kook water in je waterkoker. Snijd de uiteinden van de sperziebonen en doe ze in een pannetje met kokend water en een beetje zout. Kook zo'n 8 minuten. Snijd de champignons en paprika. Verwarm 1 eetlepel olijfolie in een koekenpan en bak de champignons en paprika totdat deze zacht en klaar zijn. Voeg tijdens de laatste minuut de kikkererwten toe om ze even op te warmen. Kook ondertussen de couscous zoals aangegeven op het pak. De mijne moet 2 minuten koken in 200 ml water en 2 el olijfolie waarnaar je de pan van het vuur haalt, de boter erdoorheen roert en dan nog 2 minuten op laag vuur laat staan. Meng de groenten door de couscous en besprenkel met appelazijn en de extra vierge olijfolie. Breng op smaak met zout & peper, verkruimel de feta erover en maak het af met wat vers gescheurde muntblaadjes. As I explained in my post from earlier today, Wednesday's are from now on no carbs for dinner day! So only a piece of meat or fish with a big plate of vegetables. I usually don't have any new year's resolutions. I believe that if you want to change you can do it any time of the year. But I was thinking about all the changes I made in 2013 and how much that, in a very positive way, changed my life and that made me think about what I want to do different lifestyle wise. One of these things was drink more water and the other one introduce one day a week at which I don't eat bread, pasta, noodles, quinoa, rice etc during dinner. Wednesday's are perfect for that goal because I don't work out on that day. For my first carbs free dinner I decided that I wanted chicken and when I was buying vegetables on the market last Saturday the asparagus were on sale so I went with these and had a mixture of other vegetables on the side. Let me know what you think of the recipe when you tried it! Boil some water for the asparagus in your kettle. Remove the dry, somewhat woody bottom of the asparagus. You can do this by breaking the asparagus, they will break right at the point that you want to lose if you hold both ends of the asparagus and then bend it. Boil them in a pan with plenty of water. The time they need to cook depends largely on their size and your preferences. They are done when they have softened. I cooked them for about 7 minutes. Then mix the agave syrup, soy sauce, crushed garlic clove and sesame seeds in a small bowl and put aside. Cut the chicken into cubes, heat up some olive oil in your wok (or frying pan) and bake the chicken golden brown in 8 minutes on medium to high heat. Meanwhile chop the vegetables. Add the onion 4 minutes later to your wok then the chicken, followed by the mushrooms and paprika. When done, turn of the heat and add the sauce. Give it a good stir so everything is covered. Put on your plate together with the asparagus. Drizzle some extra virgin olive oil over the asparagus and some fresh thyme leaves and serve. It's Wednesday, which means for me that it's sandwich time for me. I always work at another location on this day and don't always have access to a refrigerator to keep my lunch salads. Which isn't to bad since it's good to have some variation in your meals! And I also made Wednesday's dinners: no carbs dinners which means, no rice, no pasta, no potatoes, no noodles, no bread or anything. So from now on you can expect a carb free dinner recipe each Wednesday. Today I will make a simple chicken dish with asperagus and some other veggies but will post this recipe tonight! First it's time for lunch, and a made two simple but divine sandwiches using ingredients you probably already have in your home. 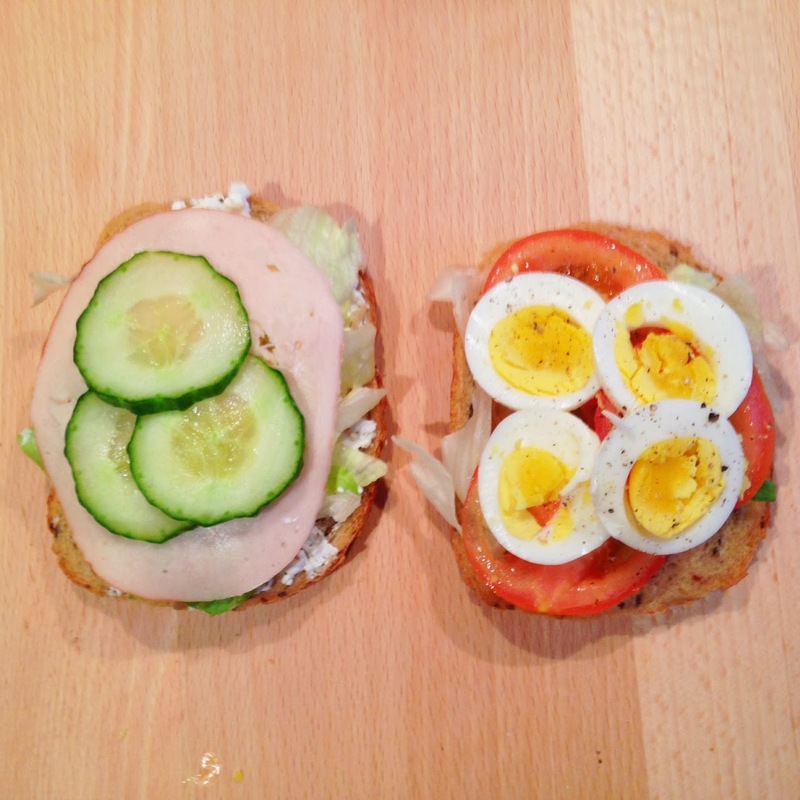 One triple C sandwich (Chicken - Cucumber - Cottage Cheese) and a simple tomato-egg combo. I had a big bowl of oatmeal for breafast and since I didn't have a snack at 11 A.M. I ate two whole sandwiches, but of course you can also make one and have a small arugula sandwich on the side. Smear the cottage cheese on one slice of bread and season with pepper. Then put the lettuce, slice of chicken breast and cucumber on the cottage cheese. Put the other slice of bread on top, slice in halve and the first sandwich is ready to be eaten. Smear the cottage cheese on one slice of bread and season with pepper. Then put the lettuce, sliced tomatoes and egg on the cottage cheese. Put the other slice of bread on top, slice in halve and the second sandwich is ready to be eaten. Yesterday I decided it was time to prep a quinoa lunch salad! But for some weird reason I didn't fancy it at all this morning! But I took it with me to work because I think it's a waist to throw away any food, especially since a lot of people do not even have the money to buy fresh vegetables and fruit! At lunch I discovered that this was a very good choice because it was pretty damn good! Cook the quinoa and let it cool down. Slice all the vegetables into pieces. Put it in an airtight box or on your plate together with the lettuce. Crumble over some feta cheese and sprinkle over the seeds. Drizzle over some extra virgin olive oil and the juice of half a lime when you're ready to eat this salad! First day back at the office after a two week vacation! Which means that started prepping my meals again! Prepped this super simple salad yesterday so I could bring it with me to work. As a consequence, I had a healthy and simple salad for lunch today that made my colleagues jealous! Simply slice the cherry tomatoes in four, cut the cucumber into cubes and put it together with the other ingredients in an airtaight storage box. Leave the avocado and boiled egg as is and only peel and cut them when you're ready to eat the salad. In a small box mix the ingredients for the dressing. Put in your refrigerator and take with you to work the next day! Time to tell you the big news! I'm working on an E-Book!! I'm super excited, all recipes are finished and almost all pictures are taken. Currently I'm working on the layout and trying to figure out the best way to sell it on my blog. I know that there are many E-Books out there, but mine isn't only recipes. The focus of the book will be how to eat clean on a budget. For that purpose I've made a varied menu for 2 weeks on a budget, including a grocery shopping list and tips to save money! So there will be 14 breakfast recipes, 14 lunch recipes and 14 diner recipes! All 1 person servings because that is something I really miss when looking for recipes in cookbooks. But the ingredients for each recipe can easily be doubled so you can make more portions if you wish. You can expect simple, quick, tasty and colorfull dishes! With beautifull pictures all taken by me (you should have seen my house at one point, it got crazy with furniture moved everywhere and decorations on the table for the pictures). The idea came when I was brainstorming with Lizzy for her coachings company Lizz is More. And since I'm always watching my spending, make sure I stay within my budget and plan my meals it was only logical that I created a menu on a budget. There will be a Dutch as well as an English version and I expect it to be up on the blog within 2 months (I need to figure out some technical difficulties). To give you a little preview I will publish one recipe so you can try it out, see how simple & delicious it is and you can get an idea about the recipes in the book! So I choose these amazing fruity pancakes which are perfect for Sunday breakfast but you can also have them for lunch! First, mash the banana completely with a fork in a bowl until it has a somewhat smooth consistency. Then add the egg, cinnamon and flaxseeds and mix well until it's a smooth batter! In the meantime cut the fruit. When these are also done place them on top of the first batch. When all the pancakes ar done, add the Greek yoghurt on top followed by the freshly chopped fruit and pomegranate seeds. Then add the shredded coconut and chia seeds and serve with some agave syrup! Prak de banaan helemaal fijn met een vork (ik vind op een bord het makkelijkst). Meng dan met het ei, lijnzaad en de kaneel in een kom totdat je een redelijk glad beslag heb. Wanneer alle pannenkoekjes gebakken zijn doe je per persoon een flinke lepel Griekse yoghurt of kwark op het stapeltje pannenkoekjes. Gevolgd door de toppings van jou keuze! I always have, and always will love a good grilled cheese sandwich! That's still my guilty pleasure. But today I made two more healthy options! I was looking through my cookbooks for some new inspiration and these are bases on recipes from Jamie Oliver's 15 minute meals. And they are good! Perfect substitute for one with melted cheddar cheese and ham! I made a vegetarian version and one with chicken. Try them out both! I only took a picture of the sandwiches before I put them in my 'Sandwich Iron' (tosti ijzer in Dutch, I don't know the correct English term..) because afterwards it wasn't so pretty. Put one slice of bread on a chopping board and put the arugula on top. Slice the mushrooms and put them on top of the arugula, crumble over some goat cheese. Season with pepper and put the other slice of bread on top and put it in your grill until it's done. Put one slice of bread on a chopping board and put the chicken breast on top. Slice the tomato and put some slices on top of the chicken. Cut the avocado into cubes, put on top and crumble over some feta cheese. Season with oregano and put the other slice of bread on top and put it in your grill until it's done. It's a new year so it's the perfect time to start following your dreams, be happy and adopt a healthy lifestyle! For all of you who are just starting on your journey towards a happy & healthy life here is a perfect carb free lunch! I love to have salads for lunch, but the last couple of weeks I had trouble with this as I was craving bread and I was giving in to it more and more. But now I'm getting back on track with this lovely tuna salad! You only need 7 ingredients so it's super easy! Roast the pine nuts and cut the cucumber and tomatoes. Then mix all ingredients on a plate, crumble over the feta cheese and finish with the pine nuts. I'm still a bit in party mode so here is another perfect recipe to serve at a birthday or if you have Tapas night! Made these a while ago and they are delightful! Mix in a large bowl the minced chicken (if it isn't minced yet by your butcher you can do this is your food processor), the chopped spring onions, crushed garlic cloves, breadcrumbs, coriander, cumin seeds, sesame seeds, chili powder, pinch of salt & pepper and the egg until it's well mixed. Put the bowl in your refrigerator for 30 minutes to make sure that all flavors are absorbed by the meat. Get the meat out of the refrigerator, make about 25 balls of it. Heat up a good splash of olive oil in the pan and bake the balls golden brown on low to medium heat within 10 minutes (depending on the size of the balls and check regurlarly of they are done, if you cook them too long they will get dry). Make sure you frequently change sides! In the meantime, heat up the passata with the dried herbs. When everything is done put the balls on a plate with in the middle a small bowl so everybody can dip their chicken balls into it!